For those people new to the Valley of the Sun, congratulations, you’ve almost made it through your first summer. Flying over the Phoenix metro area, you undoubtedly noticed the number of pools associated with homes and hotels. A good pool is a wonderful way to enjoy the dog days of summer (but don't worry, the other seasons are worth it!). A quick dip in the morning or early evening helps make those 105-degree days turn into a treat. Unlike a pool in a single family home, the homeowner’s association takes care of all the chemicals and maintenance in your community pool as part of your monthly HOA fees. You just get to enjoy the refreshing water while someone else does all the work. You can't beat rooftop pools if the view is important. The luxury highrise Esplanade Place has a small but view-worthy pool. Located in the Biltmore Area at 24th Street and Camelback, the rooftop pool and spa provide not only all day sun, but mountain and city views as well. Just relax and party with neighbors, swim laps or lay on one of the chaise lounges as you soak up the daytime sun or a great sunset. Next door to the Esplanade, the Optima Biltmore highrise has a wonderful rooftop pool as well as a barbeque/picnic area. Views are wonderful here too. No Measly Pool here - It's Resort Sized! Located in the rapidly growing north Phoenix area, Toscana in Desert Ridge offers a resort lifestyle for permanent residents. There is plenty of room to swim laps in this giant-sized pool. Along with a multi-million dollar clubhouse with fitness and lounge areas, the resort pool and spa comes with its own waterfall to help you cool off during the hottest Arizona summer. Fireside at Desert Ridge caters to pool lovers with separate areas for lap swimming or just splashing around - with slide and water features. Both pools (one is adult only) are centered around the marvelous clubhouse which features a fitness center and place for relaxing. There are plenty of chairs and chaise lounges under the awnings that surround the pool to allow you to rest without baking in the desert sun. There are some communities that have smaller pools sprinkled throughout the development, so that you don't have to walk very far to get to one. They're smaller, but smaller pools can be peaceful when you're out for a morning swim. Bella Monte at Desert Ridge is one example (shown in the photo above), with 3 resort style pool/spa areas. 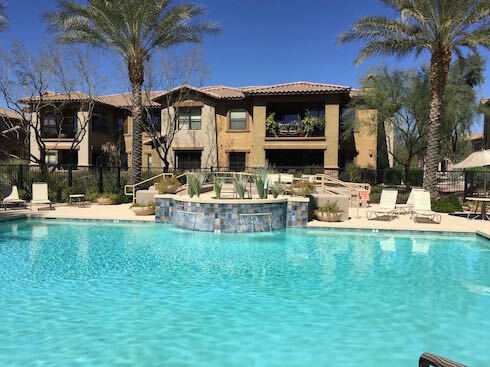 Desert Foothills Villas in Ahwatukee is an affordable community with 2 pools, so you are never far away from the water. For many people, a pool in the Valley of the Sun is not just an option. When buyers make a list of “needs” and “wants,” the pool is usually in the “need” category. Most condo developments have pools, but you'll want to find one you love if you picture yourself in one often. Also, if year-round swimming is important to you, make sure to let us know when you contact us so we can find you the best community with a heated pool. Drive down Camelback and you can't help but notice Optima Biltmore Towers, the eye-catching high-rise in the heart of the Biltmore area. It was designed to command attention, inside and out. Two towers comprise this high rise that offers panoramic views of the city lights, mountains, and the sunset from the rooftop terrace. Fireside at Norterra is a newer Del Webb all ages lifestyle community, with a combination of townhomes, condos and homes set amidst the backdrop of mountains and the striking community center. Fireside at Norterra has several condo and townhome styles, from the single level flat to the townhome models with 2 stories and a small patio. Both styles have a one or two story garage.